Local Recipe: Veggie Stuffed Turkey Burgers | Audio and video stories from Southwest Washington. Healthy eating through preventative nutrition can pretty much be summed up by simply eating as many plant-based foods as one can eat. Studies repeatedly show a direct correlation between a decrease of disease in people groups whose diet is abundant in whole, nutrient-rich, and plant focused eating. There are over 10,000 phytochemicals, or disease preventing “plant compounds,” which have been discovered so far and more are being discovered yearly. As phytochemicals are found exclusively in plants, the only way to reward your health with their life giving benefits is to consume regular amounts of nuts, seeds, vegetables, fruits, and grains. Becoming a “vegan” or completely abstaining from meat altogether is not necessary to still live and eat healthfully. I greatly enjoy a high quality piece of wild fish or meat but the key lies in selecting only the very best sources (think pastured, wild, organic, grass-fed and finished standards) and viewing them more as a side dish rather than being the main dish for all 21 meals throughout the week. In my eyes, the standard American diet is not only the worst diet modeled throughout the world but it is also incredibly boring. For example, the standard American version of a huge slab of cheap hamburger stuffed in a fluffy bun is far less of an incredible life experience than mixing a healthfully raised selection of meat with a rainbow of colors and flavors like fresh garlic, grated carrot, cilantro, and spinach. 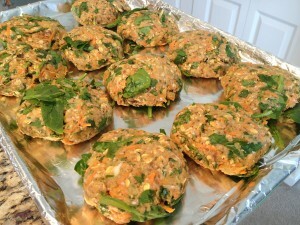 I challenge you to dive into a more color-and-flavor-filled life by trying my recipe for veggie stuffed turkey burgers! Season to taste with spices of your choosing. My favorites are turmeric, mesquite, cumin, a sea salt blend or tamari, curry, rosemary, and ginger. Grate carrot and onion either by hand or using a food processor. Mix the grated veggies in with all other ingredients. (I sometimes use a stand up mixer on low speed for a fast shortcut!) Form into patties and bake at 350F for about 30 minutes, or until the internal temperature of the turkey burgers reaches 160F. 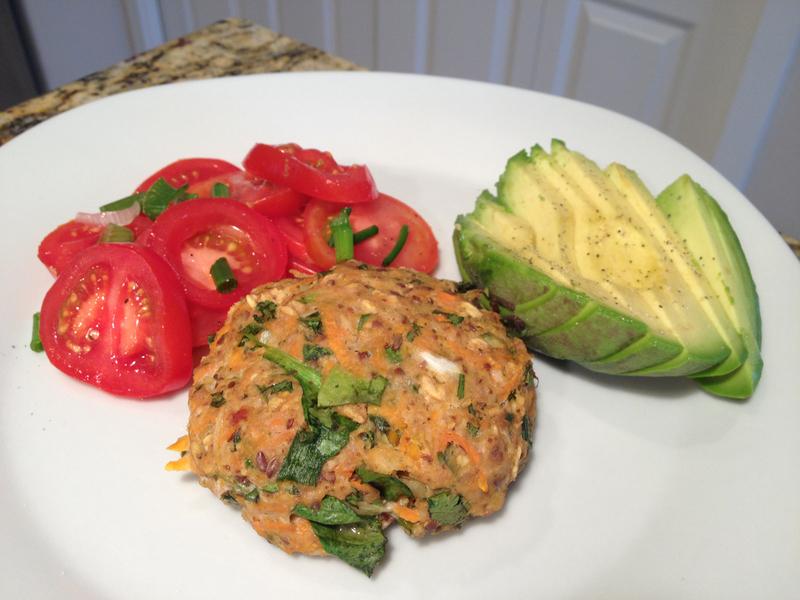 Serve with fresh sliced tomatoes, avocado, and sprouts. For a creative alternative, wrap the burger in kale or swiss chard instead of a bun or serve as it is. This recipe can be used with any other sort of wild salmon, buffalo, or other selection of meat and mixed with your choice of mix-ins such as bell pepper, basil, grated radish, sunflower seeds, etc. Be creative!